The first thing I did when I found out I was flying to the U.S. was to find the nearest UNESCO World Heritage Site to Chicago. It was a good thing there was one in Illinois, the Cahokia Mounds State Historic Site. It excited me more when I found out that we were visiting it as part of our program itinerary since the only convenient way to get there was by renting a car. 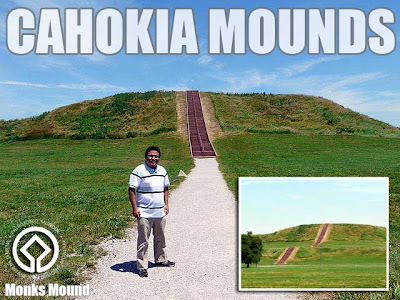 According to UNESCO, Cahokia is the largest pre-Columbian settlement north of Mexico and was occupied primarily during the Mississippian period (800–1400), when it covered nearly 1,600 hectares and included some 120 mounds. The main mound in the complex is called Monks Mound, the largest prehistoric earthwork in the Americas, covering over 5 hectares and standing 30 meters high. After watching a video at the Interpretative Center, we walked around the park and got to climb up Monks Mound where you can see nearby St. Louis, Illinois. If you don't want to rent a car, public transportation to the place is possible but a bit complicated. Directions are available in the Cahokia website. 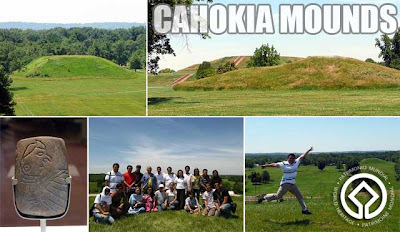 Take note that the Cahokia Mounds are in Collinsville, Illinois and not in the city of Cahokia.